Presented in a black gift box for easy gift-giving, this popular Sushi For Two set is perfect for anyone who appreciates great food. Cobalt Blue Sushi Set includes two 8.75" x 5" rectangular plates, two 3" sq. 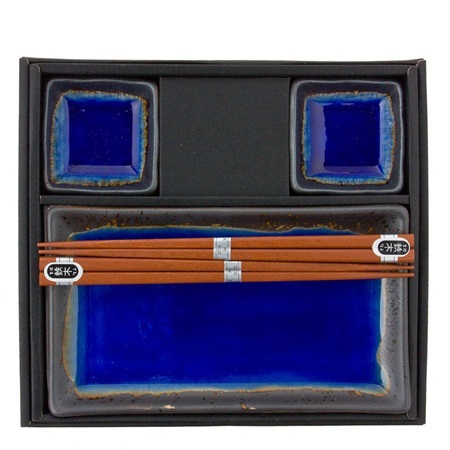 sauce dishes and two pairs of chopsticks packaged in a black gift box. Use the sauce dishes for votive candles and one of the plates as a tray to place them. The beautiful color makes a great addition to any bathroom decor. The Sushi Sets in different designs/colors are also available. See more. Please note that this item has a crackle glaze as shown in an image of another item in this series. This is not a defect. Color may also vary slightly.